Police in Pelham, New Hampshire are searching for suspects in a street fight caught on tape. Police in Pelham, New Hampshire, are searching for suspects in a street fight that was caught on tape in the parking lot. At least one of the suspects can be seen in the video with what police believe to be is a revolver. The fight occurred on June 28 at approximately 10:30 p.m. in the parking lot of Tobacco Junction on Bridge Street. According to a witness, the fight broke out between two males outside of Tobacco Junction. Police believe that others associated with those males quickly became involved. 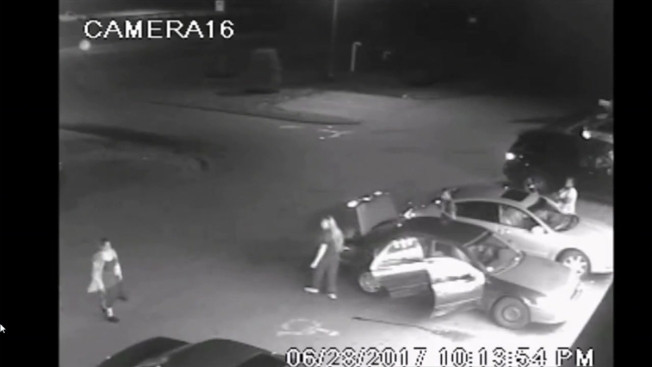 In the surveillance tape taken from the store, one of the males originally involved in the fight can be seen opening his trunk and pulling out a possible firearm. The unidentified male then shows his gun to the other people involved in the fight. Those suspects then got into a light-colored Ford Edge and took off southbound on Bridge Street. The male with the possible firearm can then be seen motioning as if shooting the gun at the moving car. The involved parties did not file a police report, but Pelham police are looking to identify anyone involved in the incident.